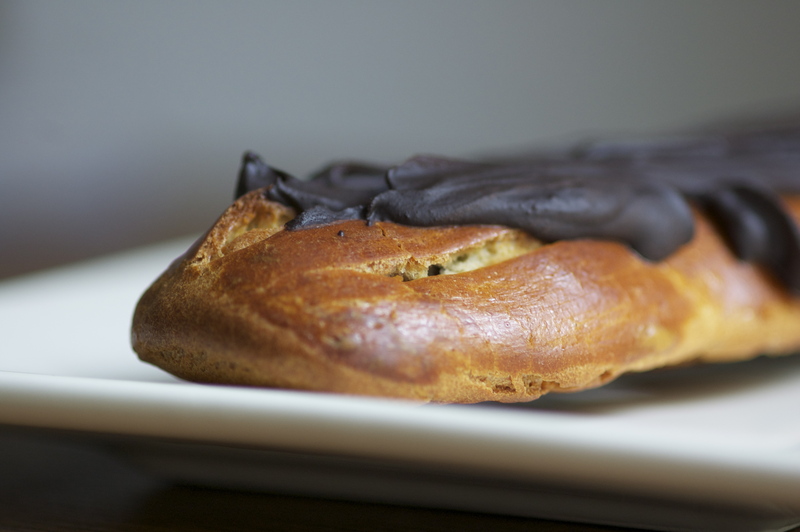 We were up until 2am this morning making (and eating) chocolate éclairs. No, it’s not the baby that keeps us up; it’s self-imposed French pastry projects. Well, I wasn’t actually doing the baking part. Making éclairs was Sébastien’s rainy Sunday project. I was just there to take photos, wash a few pots, help fill a couple piping bags, and lick my gooey fingers. Sébastien says this is a work in progress, but I must admit that the result of this first attempt was pretty successful and deserves a post. Since neither of us had ever ventured into making éclairs, Sébastien opted to follow a single recipe and stuck pretty close to it. He had found the recipe on Marmiton, a very popular go-to cooking site here in France. I probably spend too much time on this site, but they tend to have good, easy recipes. According to the site, this is a “quick” éclair recipe (if you call an hour and a half quick, that is). In our case, it took 3 hours, though we did manage to have dinner while the cream filling was cooling. 1. Preheat oven to 210°C. 2. Put butter, water, sugar and salt in a saucepan and bring to a boil. 3. Add the flour and mix until firm and compact (Sêbastien did this off heat). 4. Add the 4 eggs, one at a time and mix well after each one (still no heat). 5. Work the dough until it’s firm (we ended up adding some extra flour because it was too liquid). 6. Put the dough in a piping bag and pipe onto a baking sheet, into the shape of éclairs (about 15 cm long and 2 cm wide). 7. Cover with some egg yolk so that the dough will become golden when cooking (we let the dough cook a little first because it still wasn’t firm enough and then spread on the egg yolk). 8. Cook about 25 minutes and let sit in the oven for 10 more (heat off). This helps keep the dough from collapsing. 1. Melt 60 grams chocolate with the milk over low heat. 2. In a bowl, mix the egg, egg yolk and sugar until creamy. 4. Add this mixture to the chocolate/milk combination. 5. Keep mixing as the cream thickens. 6. Off heat, add 20 grams butter and let cool. 7. Fill the puffed pastries with this cream. The original recipe recommends cutting the éclairs in half to fill them. Instead, we cut two small holes in the bottom of each one and used a piping bag to fill them. That’s how we saw the pros doing it on TV, so couldn’t resist. 1. Melt the rest of the chocolate and the butter in a double-broiler. Cover the éclairs (using a spoon) and let harden. ← What’s a Gour Noir?